Looking for a first anniversary gift that your husband or wife will really love? Here are 15 creative 1-year anniversary gifts to inspire you, including some modern twists on traditional gifts. Did you know that there's actually more than one type of traditional 1-year anniversary gift? Paper gifts are traditionally given as on a first anniversary. I guess they know that you don't have much money in the early years of marriage! Clocks are a more modern gift tradition for first anniversaries. Carnations and Pansies are the flowers of choice to give your partner on your first anniversary. Gold Jewelry is the type of jewelry to give on your first anniversary, according to the American Gem Trade Assocation (really!). So are you feeling a bit confused? What should you give her for a first anniversary gift? Or him? On this page you'll find a range of unique, creative, sentimental, and lovely gift ideas, whether you want to stick with tradition or not. I really hope you find something you like for this significant anniversary! A playful "paper"-themed 1-year anniversary gift idea is to buy your partner a pendant shaped like a paper airplane. 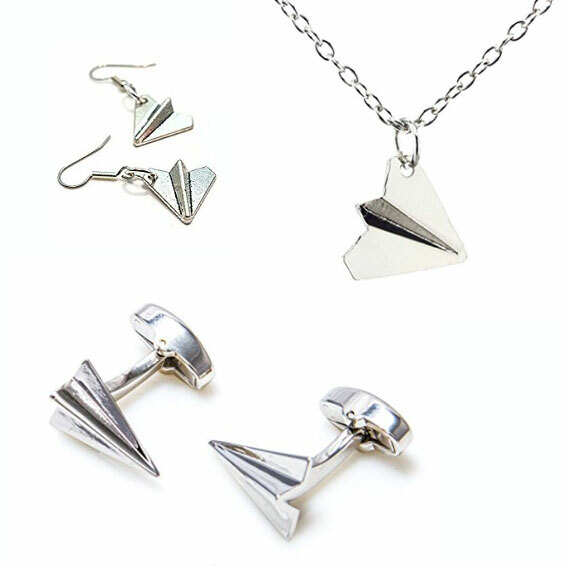 You can find paper airplane cufflinks, pendants, and earrings on Amazon, or look at your local jewelry store. 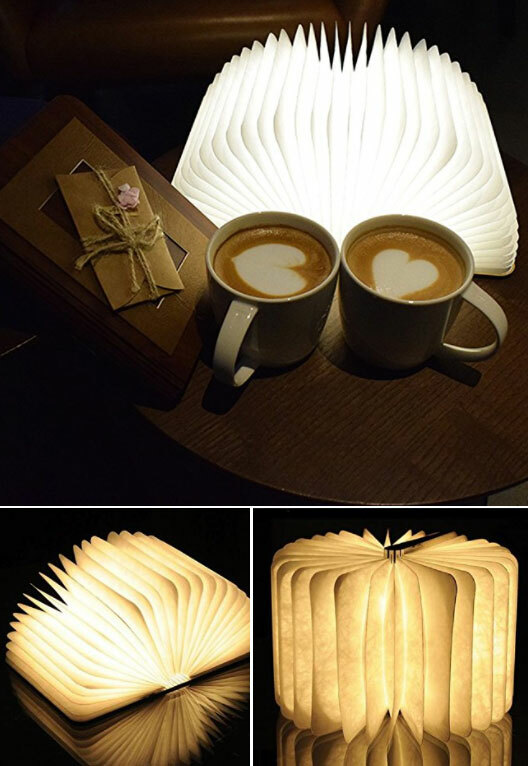 These unusual book lamps are a fun paper anniversary gift for the avid reader, or anyone who likes to receive quirky gifts. The American Gem Trade Assocation says gold jewelry is the gift to give for your first wedding anniversary (really!). 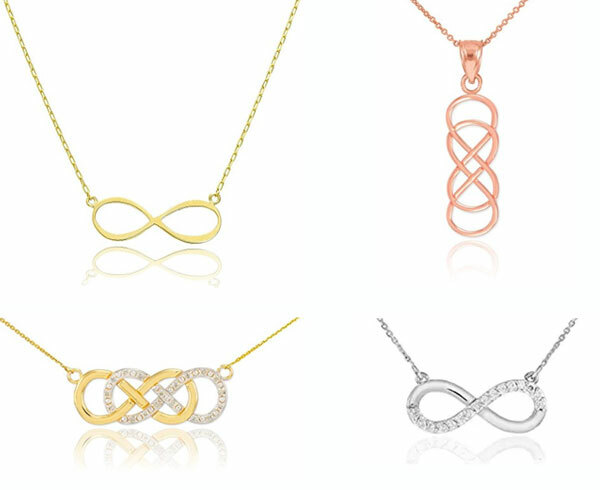 If you want to honor this tradition, then a beautiful gift for your wife would be an gold infinity pendant. Every time she wears it it will remind her that you want to be with her forever. If you're looking for a fun paper anniversary gift idea, book some tickets to something (or somewhere!). It's a gift of time together and will make more special memories in your married life. 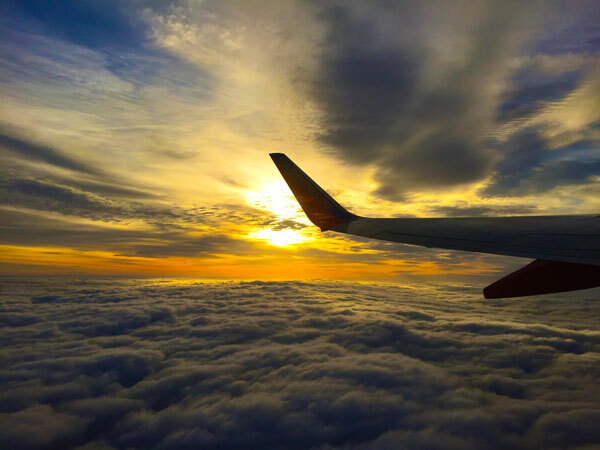 Get airplane tickets or train tickets for a day trip or weekend away, or tickets to a match or theatre show for an afternoon out together. It's always exciting getting tickets to something or somewhere! 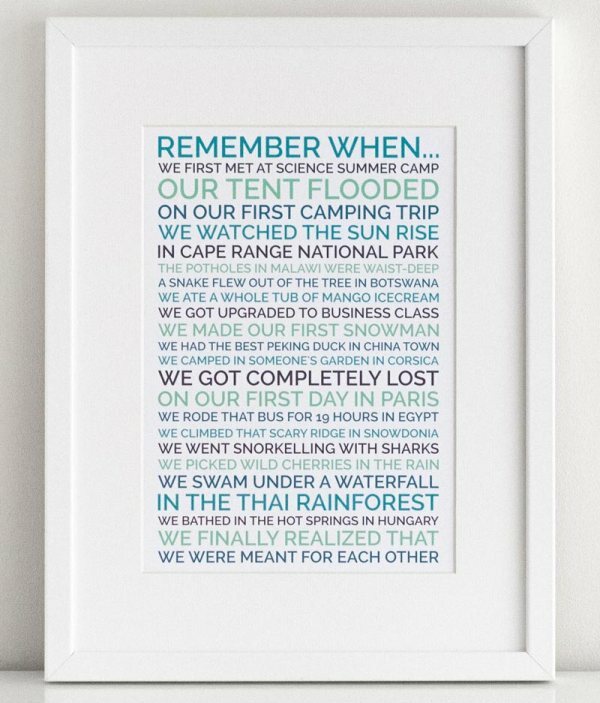 Reminisce over the special moments in your relationship with our "Remember When" printable poster. Think of all the fun, crazy, silly, special things you loved about the year together, and collate them in this fabulous poster. It's such a personal, thoughtful paper-themed first anniversary gift, and will be a memento of your first year of married life for years to come. The "modern" gift list says that you should give a clock as a first anniversary gift. 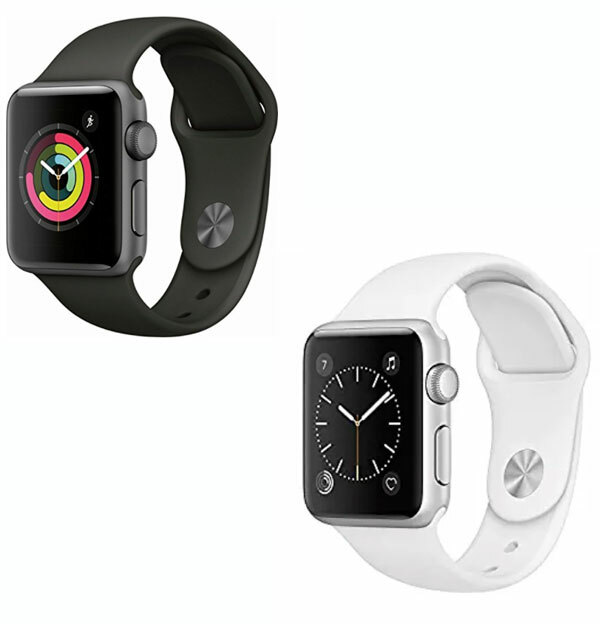 But I think an even more modern gift would be a smart watch. Super practical, stylish, and you can send cute messages to each other on them! 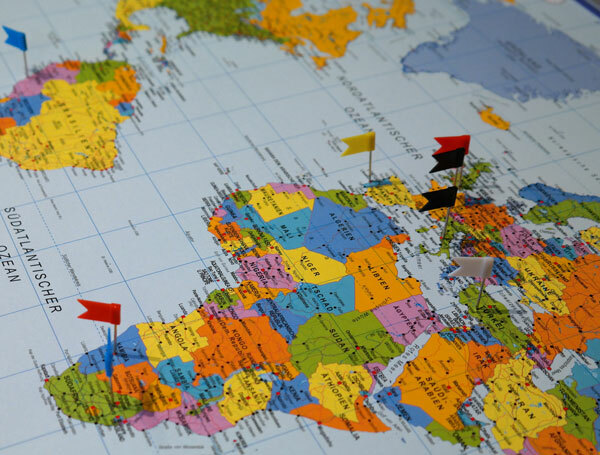 Embrace the paper gift theme: Buy a big paper map of the world and mark it with the places you've been and the places you'd like to travel together. This really suits the intrepid couple who is always looking for the next place to visit! Don't want to make it yourself? Then you can order Personalized Map Art Prints from Amazon. Anniversaries are such a wonderful time to be romantic! 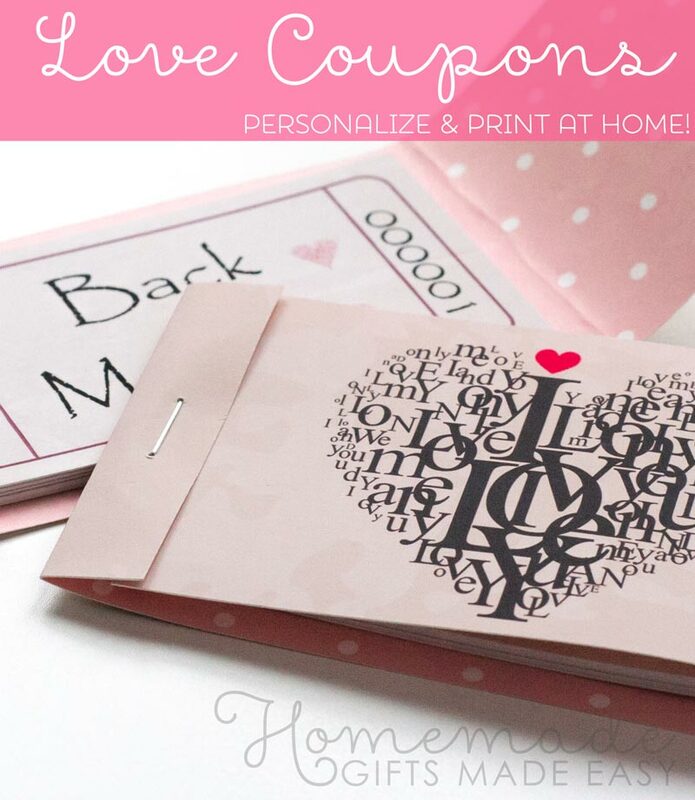 These printable paper love coupons are a gift that keep giving, and with editable text you can tailor them perfectly to your partner. 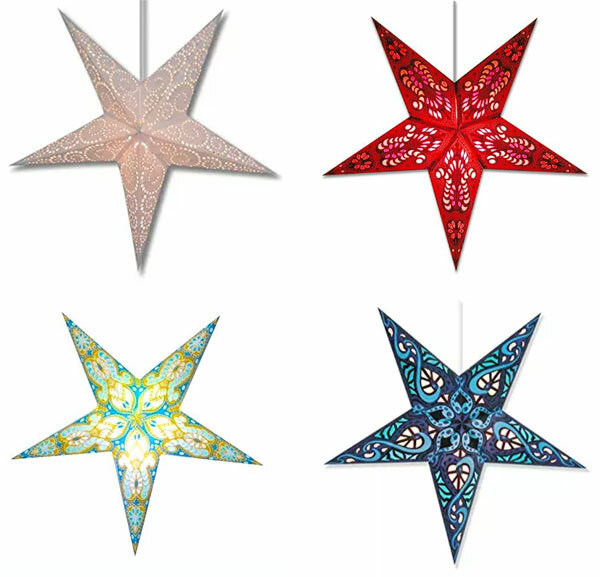 These paper star lanterns are a gorgeous first anniversary gift for someone who enjoys spending time in their reading nook or den. We also have some DIY paper star instructions if you want to make your own from scratch. 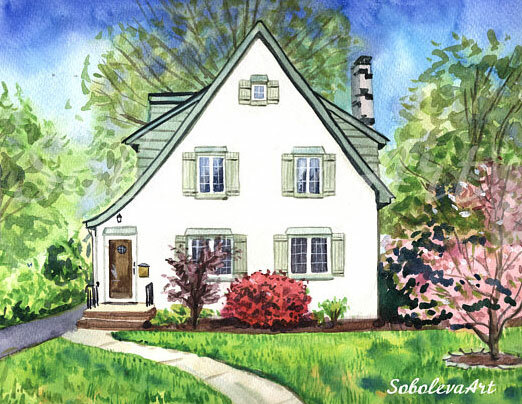 Commission a custom ink sketch or watercolor painting of your first home together. Or, choose another location that has sentimental value to you both, like the place you met. You can find many artists offering this service on Etsy. It's a beautiful first anniversary gift that keeps to the paper-theme. For example a beautiful custom watercolor from Soboleva art. A photo-book of the first year of your marriage makes a wonderful paper anniversary gift. It's a lovely memento for your partner and you to look through and reflect on all the things you've done together! 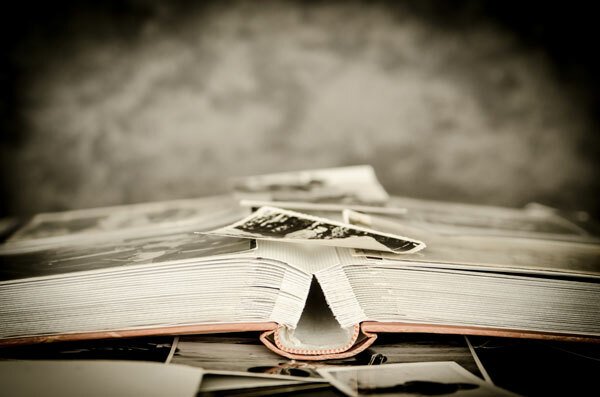 You could start with a favorite photo or two from your wedding day. Then include photos from your honeymoon, of your house together, any special trips you've done, and relaxed times hanging out at home. Try to include key events over the years - holidays, children, pets, houses, cars. There are so many online services that you can use to design and print your book, like Snapfish or Shutterfly. Or you can do a scrapbook and include written notes and other tickets/mementos from the year too. This idea takes a bit of time to make, but it is a great one for those of you who are organised to do it in time! 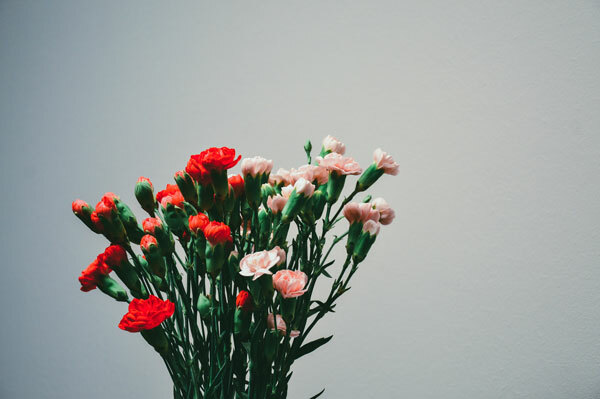 The traditional 1 year anniversary flower is the Carnation, given as a symbol of commitment and joy for the coming year. Buy your partner a beautiful bunch of carnations on your anniversary. Or, pick up a packet of carnation seeds that you can plant together, creating a beautiful garden of flowers to enjoy year-round. If you want a small, symbolic first anniversary gift, then a simple paper rose could be just the thing. 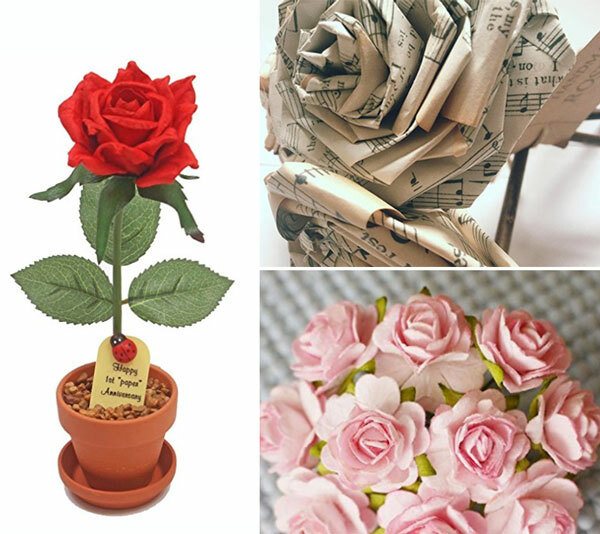 Order one online, or fold your own with our DIY paper rose instructions. 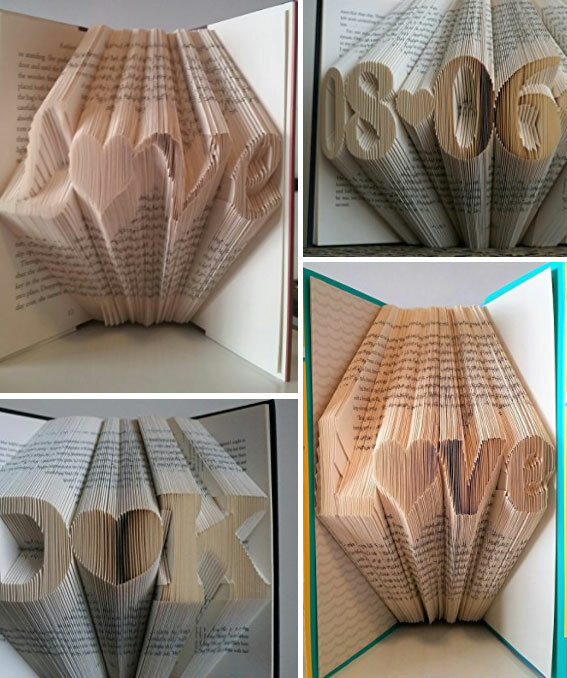 A folded book is a beautiful and unique first anniversary gift idea. You could choose to have a special sentiment like love or hope, or your initials, or the date of your marriage. 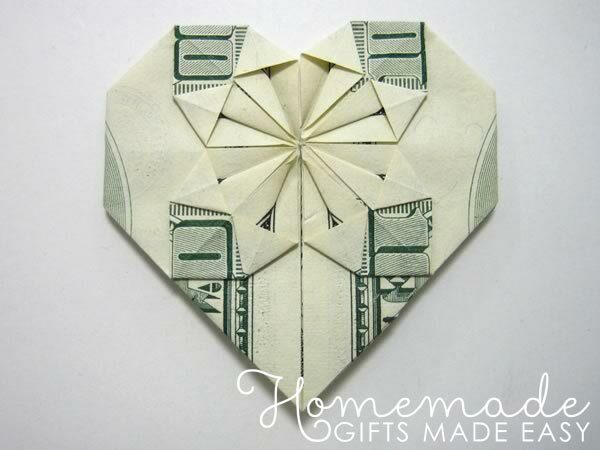 An "easy" first year anniversary gift could be to give your other half some beautifully folded money and tell them you're taking them out for a day of fun. Take them to the mall, or to a bar dancing, or out to dinner - whatever suits their style. Looking for the perfect words to say "happy first anniversary"? We hope you found a great first anniversary gift idea from our collection of ideas, and we wish you all the best for your future years together. May they be happy, healthy, and full of fun and laughter.